The term keloid refers to hypertrophc, or puffy, scars on the skin. Keloids are often the result of burns or other skin traumas and are almost blisterlike scars. While keloids are harmless, they can be unsightly and embarrassing, especially when they're on visible parts of your body. Keloids can be flattened for a more natural appearance through a number of therapies that you can discuss with your dermatologist. Schedule an appointment with your dermatologist to talk about cryosurgery. Cryosurgery is the same technology used to remove warts and other skin growths, where the growth is frozen via liquid nitrogen and then scraped away. The American Osteopathic College of Dermatology states that cryosurgery is an excellent treatment option for keloids. Ask your dermatologist about using corticosteroid injections to help flatten your keloid. A report published in a 2009 issue of "Dermatologic Surgery" notes that corticosteroid injections are effective in softening and flattening the keloid, even if they can't remove the keloid altogether. Corticosteroid injections must be done by a trained dermatologist. Wear compression garments with your dermatologist's approval. Wearing compressing garments, especially after surviving skin trauma like third-degree burns, can help flatten the keloid and inhibit its growth. Most effective when applied to a fresh scar, compression garments stay tight to the body to keep the keloid from developing further. Apply silicone gel pads to the keloid as a part of your scar therapy. Silicone gel pads are moist, silicone covered patches that, when applied directly to the scar, can help keep the scar soft and pliable while advancing the maturation of the scar. Silicone pads must be used with the direct supervision of your doctor or dermatologist. They're typically worn all day and in serious cases, overnight as well. Talk to your doctor about the possibility of scar revision therapy. 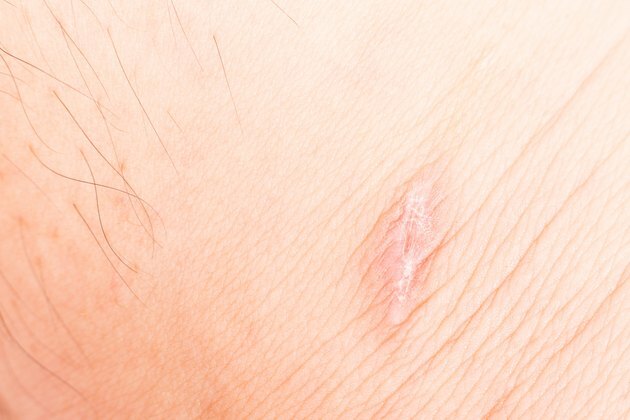 If your keloid scar is uncomfortable, impedes your movement or is especially embarrassing, a plastic surgeon can actually cut out the keloid and replace the skin with grafted skin from elsewhere on your body. This is an expensive and serious surgery, so it's important that you weigh your options with your doctor beforehand, to ensure that scar revision surgery is the right choice for you. While it can help flatten the keloid once and for all, it will likely leave behind further scarring to be managed. Can You Flatten Scars Naturally at Home?